Our music scanning software delivers scores and instrumental parts of the highest quality, and offers the ability to create music arrangements by scanning and converting printed sheet music into printable and editable music notation files or MIDI files completely automatically. Get perfect results in just a few clicks! Scan your music and convert your printed sheets into music notation or MIDI files. Arrange and edit them in a music notation program or a MIDI sequencer. With SharpEye, a highly-acclaimed music scanning program, you can scan and convert printed sheet music into playable scores completely automatically with what is called music OCR, or OMR (optical music recognition). The music OCR process requires no user interaction and works much the same way as common text recognition. SharpEye Music Reader makes it easy to convert a scanned image of printed music into a MIDI file, a NIFF file, or a MusicXML file. Just feed your sheet music into a scanner, and SharpEye will pick up the images, recognize the scores, and produce music notation files or MIDI files. Used at its simplest, SharpEye lets you simply scan a printed sheet, or open or drag an image file with scanned sheet music onto its window. Click “Read” and wait for the conversion to finish. The result is conventional music notation shown in a new window. Yet another click saves the result as a music notation (MusicXML) or MIDI file. Want to make a correction? SharpEye has a built-in editor for making changes to the results of the music OCR. Most likely you won’t need anything other than the mouse and the ‘Delete’ key to make all the corrections necessary. The original printed sheet music automatically scrolls to the right place as you edit the OCR’ed results. SharpEye will warn you about each bar that doesn’t make musical sense. Think of it as a music spellchecker that directs your attention to likely errors. This is what the score looks like after being recognized by SharpEye and imported into a music notation editor. After importing into a music notation editor, you’ll be able to access all the features for editing, transposing, and printing scores, as well as making music arrangements. SharpEye comes with a built-in TWAIN module allowing you to automatically scan and recognize printed sheet music. There are numerous solutions for transposing and printing sheet music available. If printing sheet music is all you need, the free MagicScore Print Sheet Music tool will fit the bill at no charge. Numerous tools are also available for transposing and editing music. 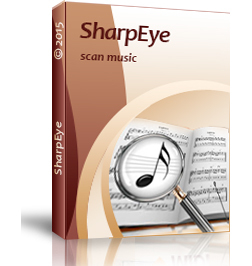 SharpEye can be used with a notation editor such as MagicScore Maestro, MagicScore Guitar, or MagicScore Songwriter, as well as other top-grade music notation products. The SharpEye 2.68 + MagicScore Maestro 7 bundle is a complete solution for working with sheet music offering the perfect price/performance ratio. SharpEye can scan and recognize scores, or recognize scores saved in a monochrome or black-and-white TIFF file. To recognize scores published in PDF format or available in color TIFF or other image formats, you’ll need a free image format converter. You can use all MIDI sequencers and music notation editors together with SharpEye. The difference between them is simple: While MIDI sequencers are targeted to produce the best sound output, music notation programs aim to produce the best printed results. Granted, some MIDI sequencers can print sheet music, and most music notation editors can play it back. However, choosing the right kind of tools can make your work more convenient and the results more convincing. If you choose using a MIDI sequencer, SharpEye will export the score as a MIDI file that can be imported into the sequencer. This way, you lose some information about how the music is laid out. If your primary interest is the sound, this may not bother you; however, if you ever want to print the sheet music again, this approach is far from ideal. For getting quality results in printing sheet music, you’ll need music notation software. Most modern notation editors today can recognize either the NIFF or MusicXML format produced by SharpEye. If you already own one of the popular music notation editors such as MagicScore, Finale, or Sibelius, then SharpEye is the only thing you need. If you are starting from scratch, a bundle deal is highly advisable. You can order SharpEye together with one of the MagicScore products at a great discount. Which notation editor is right for you? Refer to the following table to decide. In fact, extremely well! C’T, a German computer magazine, reviewed popular music scanning and music notation programs, evaluating the results of scanning and recognizing the scores of different quality. SharpEye won two tests out of three, including the test of recognizing the most complex score. Need more information about our music scanning software? Complete user guides and manuals in several languages are available for download from the Manuals page. What’s New in SharpEye v2? SharpEye v2 produces more accurate scanning results. You’ll spend less time editing and correcting recognized music. The more you use SharpEye, the more you’ll appreciate the new OCR module! SharpEye v2 recognizes more symbols, including dynamics (ppp…fff) and hairpins, grace notes, chords and beamed groups that cross two or more staves, as well as accented characters in lyrics. SharpEye v2 adds support for direct scanning from TWAIN-compatible scanners. SharpEye v2 adds MusicXML export in addition to NIFF and MIDI. Finally, SharpEye v2 implements numerous enhancements to the music editor to speed up the correction process and deal with more symbols. SharpEye music scanning software will work on any Windows PC running Windows 95, 98, ME, NT4, 2000, XP, Vista, or Windows 7. You may want to install optional MIDI sequencer or music notation software to make use of music notation files or MIDI files produced with SharpEye. Windows comes with a simple MIDI player to play back MIDI files saved by SharpEye. For serious music work, one of the following programs is recommended: music notation and composition programs or MIDI sequencers.